I was trying to make the crumble part of apple crumble. Usually I make a great apple crumble topping. I take some organic plain flour, some mild olive olive, some water and some sugar. I chuck a bit of each in the bowl, rub it together with my fingers into a crumble consistency and normally it works out great. Apparently what I had made was pastry. I had thought as much and had started to line the bottom of a glass pie dish with it. My mum instructed me to scrape it out of the bottom of the glass dish, roll it out fairly thinly and use it as a topping. Glass is apparently not a good conductor of heat and I would have ended up with a soggy mess. If I was going to use it as a pie base, I would have needed a metal tin which is a better conductor of heat. So in the same way I would have if I was making crumble, I cored, peeled and sliced some bramley apples (I usually do one apple per person). I then cooked them for 1 minute in the microwave in a small amount of water. I poured the apples into the glass dish with the apple juice and mixed in the cinnamon. TIP: You don’t have to part cook the apple first, but then the pie will need to stay in the oven 10 to 20 mins longer (depending on your oven) to ensure the apples are fully cooked. Lastly I rolled out the dough, brushed some olive oil over the top of the glass dish and placed the dough on top of the pie. I allowed it to drape over the edge of the glass pie dish and chopped off the excess with a knife. This isn’t a great idea as it all got stuck to the side. Next time I will chop it off so it just covers the apples. 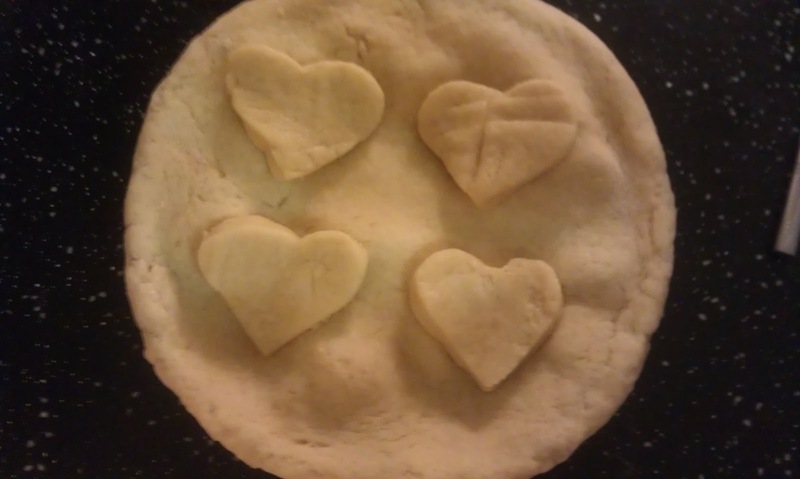 I made so much dough that I decided to cut some hearts out and place them on top of the pie. I then brushed the pie topping with some milk (you can substitute the milk for egg or water if no milk is available) and put it in the oven for around 30 mins at 180 degrees C.
It tasted just like the apple crumble I usually make with a different texture to the topping. Still yummy and it all went in one sitting. I’ve always wanted to make apple pie, so I was actually quite excited when I made dough instead of crumble mix! I still had a lot of dough left over, so I put it in a container which I labelled and dated and then popped in the freezer for another time. So we will be having this apple pie again, but this time on purpose. With all those hearts and Valentines Day coming up I might make it for a romantic dessert for 4 (me, my husband and my 2 kids)! If you wanted to make individual portions for a romantic dessert for two rather than the whole family, you could just scale down the ingredients, top the pies with one heart each and cook the pies in oven safe ramekins ! Have you ever made a dish by accident? Was it something you would eat again? 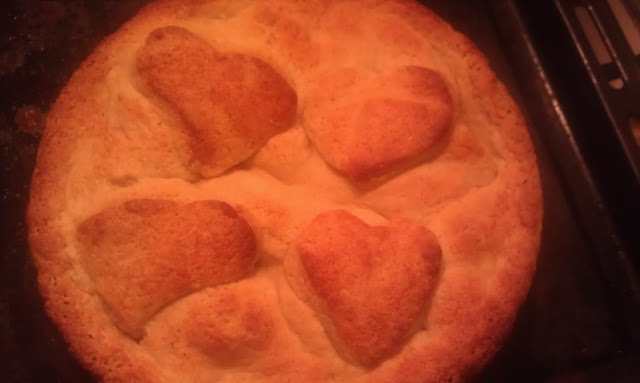 This entry was tagged apple pie, eco, Food, Frugal, Green, leftovers, recipe, thrifty, Valentines. Bookmark the permalink. ← Please nominate me for Best Thrifty Blog!